“Ich bin sehr glucklich!” Translation: “I am very happy!” In fact, a lot of people have been very impressed with the nice looking, solidly built and very smooth BMW 523i. The impressive Germanic package all starts with the sleek aggressive head-lighting at car’s front end. And there is no mistaking that the low profile front end is a “Beemer”. The distinct large kidney grille identifies this low slung sedan as one that could only come from the BMW marque’s line-up. Enter the luxurious cabin via the solidly designed doors, and you discover the cabin overflows with beautiful colour coordination, textures and style. The car boasts seating for five adults which is so incredibly nice. Long journeys are a relaxed and enjoyable affair. The front seats are electronically “Active”, and they make for an easily locatable driving position so that your body shape and length fits snugly behind the wheel. The elegant dash holds a premium world-class audio system that is supremely clear – so much so, that you could close your eyes and swear you were actually seated inside one of the largest concert arenas listening, live, to your favourite musical artists. Just don’t close your eyes for too long if you happen to be the driver! To tickle your musical ear even further, the i.pod interface feature gives in-car musical entertainment like never before. Auxiliary jacks are also available for any further electronic equipment you may care to take. Maybe you might have a document you need to work on your weekend away. No problems, the BMW 523i allows you to plug in your laptop and get to work. Have a problem with a leaded right foot? Like me, you’ll be happy to know that the easy to use cruise control feature is there to help you keep speed-legal. BMW have given the new car buyer plenty of scope to individualize the car to suit their tastes. Everything from the seat fabric to the trim inserts (The cylindrical ground aluminium trim looks very sophisticated and modern. ), the interior colours to the type of steering wheel (In my book, the leather covered steering wheel with aluminium trim looks very distinguished!). You’ll be pleased to note that there is ample of storage space available for all the nic-nacs that inevitably find their way into a family motor vehicle. If space is an issue, then you can always opt for BMW designed roof boxes to hold any extra luggage. These are convenient and simple to load. The Blue Tooth hands free kit with wireless connection is witness enough to how BMW continues to lead the way in automotive technology and innovation. What’s it like to drive? The 2.5 litre inline six-cylinder engine is as smooth as silk – even when poked along with verve. In no time at all the instantaneous engine response can thrust the full blast of the 140 kW power rating at the road with ease while returning an average fuel consumption figure of only 9.3 litres/100 km. The engine has 230 Nm of torque available at 3250 rpm. The remarkably efficient engine management system is capable of whisking the BMW 523i from 0-100 km/h in just 9 seconds. A top speed of 233 km/h can be achieved without fuss, and the 0.28 drag coefficient ensures that the procedure is carried out silently. The chassis is extremely tight, making driving a true pleasure in true BMW fashion. Road bumps are soaked up without objection, and high speed cornering remains very level and balanced – just the way a driving enthusiast likes it. 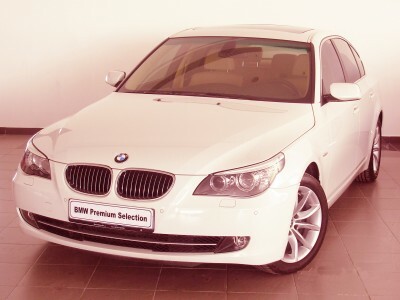 Lead from the front and drive the sophisticated, and very suave, BMW 523i sedan. You’ll be “sehr glucklich”! For any more information on the BMW 523i, or for that matter any other new car, contact one of our friendly consultants on 1300 303 181. If you’d like some fleet discount pricing (yes even for private buyers! ), we can submit vehicle quote requests out to our national network of BMW dealers and come back with pricing within 24 hours. Private Fleet – car buying made easy!